Caspar David Friedrich is the foremost of the German Romantic landscape painters. His mystical paintings continue to fascinate us. 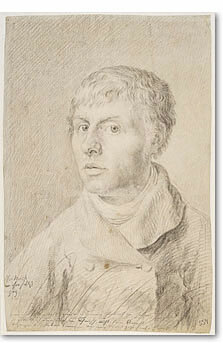 Caspar David Friedrich is widely regarded as the most important of the German romantic landscape painters. He was was born in Greifswald on the Baltic Coast, as the sixth of ten children. He was confronted with death at an early age. His mother died when he was just seven years old, and he lost two sisters and a younger brother within a few years; Johann Christoffer drowned before Caspar David's eyes when he fell through the ice on a frozen lake. This personal tragedy certainly explains some of the melancholy and the presence of death in many of Friedrich's paintings. At the time when Caspar David Friedrich was born the Baltic Coast was a Dominion under the Swedish Crown, called Swedish Pomerania. Then, during the first decade of the nineteenth century, France occupied this area. But Friedrich was a German patriot, and his art was altogether anti-French. In many of his paintings this political stand is evident, perhaps most clearly displayed by the traditional German clothes that he let many of his figures wear. Friedrich also kept a brotherly feeling towards Sweden throughout his life. In his painting The Stages of Life there is a depiction of his three children holding a Swedish flag. He began his studies of art when he was just sixteen. His teacher took him on field trips; so at an early age he learned to sketch from nature. Later he studied at the Academy of Copenhagen. He became an excellent draughtsman. At the beginning of his career he used mostly ink, watercolor and sepia's. After he became more established, he began to paint in oil. His paintings are easy to recognize; he is famous for the magical light that seems to shine from within the canvas itself. Very often there is a figure in the foreground, with his or her back turned to the viewer: the Rückenfigur. The figures are small, they are contemplating the view, and invite us to do the same. And the view is of a nature that is beyond human control, it's unreachable and merciless, and at the same time it inspires to hope for eternal life. He made sketches from life, but often mixed scenes from completely different locations when he completed his paintings. There has been a tendency to over interpret the symbolic meaning of his paintings. No doubt there is a deeper truth hidden in his melancholy paintings. But there is also an exact depiction of nature. Probably the best description of the character of his paintings is: "...like photographs of a dream" ( Kristoffer Arvidsson, Alternativ Konstgeaneologi, www.kristofferarvidsson.se). Two of his best known paintings are Monk by the Sea (1809) and The Sea of Ice (1823-24). Even though Friedrich settled in Dresden, he continued to find scenarios for his paintings along the coastline in northern Germany and on the island of Rügen. Caspar David Friedrich gained success early in his career, though there seemed to have been some factors that prevented a complete breakthrough. His anti-French manner, the thin way in which he applied his paint, as well as his deeply personal version of the romantic landscape contributed to the setbacks in his career. The writer, poet, and dramatist Johann Wolfgang Von Goethe became an early admirer and helped Friedrich's career by giving him favourable publicity. And Friedrich had many friends, both artists and writers, that supported him. One of them was the Russian poet Vasily Zhukovsky, who recommended Friedrich's paintings to the Russian royal family. This is why Friedrich has had an impact on Russian nineteenth century artists. "I am not so weak as to submit to the demands of the age when they go against my convictions. I spin a cocoon around myself; let others do the same. I shall leave it to time to show what will come of it: a brilliant butterfly or maggot." Caspar David Friedrich died in obscurity in 1840. During the first decades of the twentieth century there was a renewed interest in Friedrich's paintings. But his reputation suffered from the attention given to it by the Nazi regime during the second world war. To the Nazis, Friedrich represented their ideals. Of course, Friedrich himself had none of these ideas in mind when he contemplated over the landscape a hundred years earlier. Not until the 1970s could the public free itself from this delusion. But since then, the importance of Caspar David Friedrich's contribution to modern western painting has become clear. Today his vision appeals to a large audience all over the world, and in Germany his legacy is considered a national treasure. In 1993 one of his paintings was sold for sum of 3213000 USD. "The artist should paint not only what he sees before him, but also what he sees within him. If, however, he sees nothing within him, then he should also refrain from painting that which he sees before him." "Close your bodily eye so that you may see your picture first with the spiritual eye. Then bring to the light of day that which you have seen in the darkness so that it may react upon others from the outside inwards."